This kit is ideal for anyone wanting to carry out the popular bike throttle body modification. Bike throttle bodies offer excellent performance, reliability and fuel economy without the pricetag normally associated with TB conversions! These conversions are very popular in both modified and kit car circles as well as Hillclimb and Motorsport applications and provide a low cost, simple power upgrade not to mention a fantastic soundtrack! NOTE: A standalone mappable EFI ECU will be required to run this kit on your car (the standard ECU will not support individual throttle bodies). We can supply Motosport Electronics and Omex ECU's, please see our other shop items. 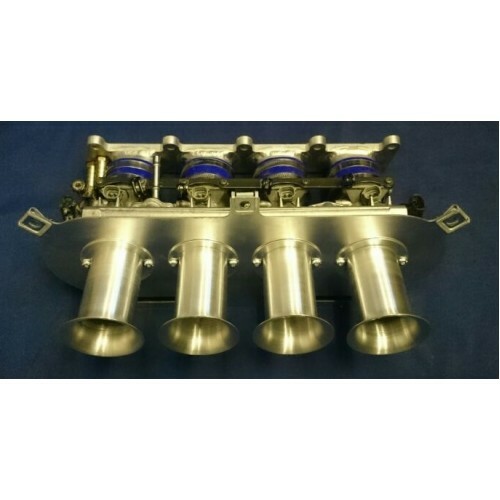 The manifold is manufactured from high quality aluminium with a precision Water Jet cut 10mm thick flange and TIG welded 51mm (Outside Dia) runners with a 3mm thick wall. All internal joints are fully ported/ground to ensure a smooth flow. 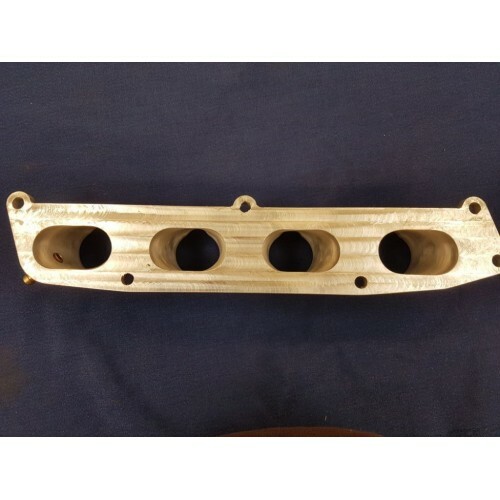 All danST supplied Throttle Bodies undergo a comprehensive inspection, strip, ultrasonic clean and rebuild process. Note: If your vehicle is a drive-by-wire operated throttle it will need to be converted to a cable system to run ITB's or carbs. Off the shelf pedal kits are available for this purpose from 'Pure Motorsport' among others for around £50. 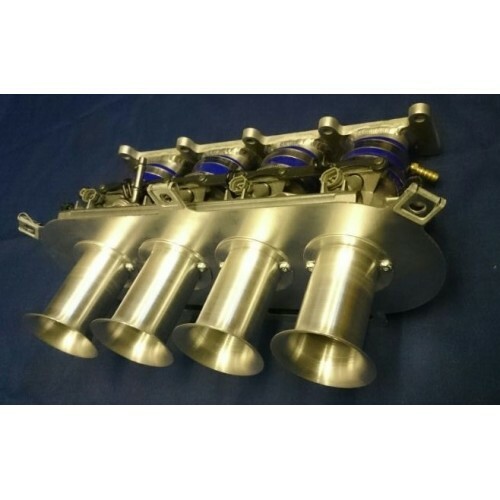 Please Note: All of our throttle body kits are made to order and therefore on a 10 working day lead time. 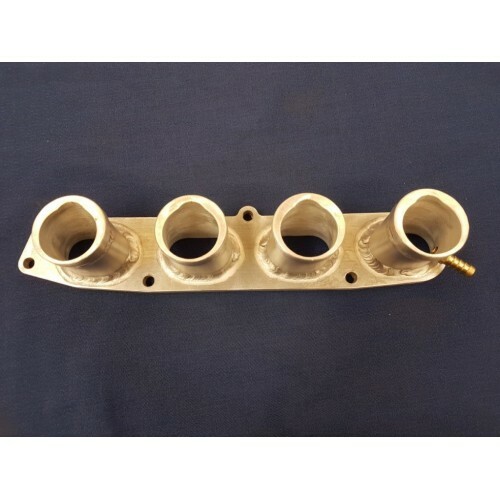 This is to allow the manufacture of the manifold and preparation of the throttle bodies. 1.1 Crank Position Sensor. All ECU's need to know where the engine is relative to TDC at any point in time. This is achieved with a crank position sensor reading a toothed profile (For example: Ford 36-1, or Vauxhall 60-2) either on the engines flywheel or front pulley. If an engine is already equipped with a crank sensor then given that the new ECU supports the tooth pattern of the OE sensor arrangement aftermarket sensor and trigger wheel will need to be fitted to the engines front pulley (see our shop for univeral items). 1.2 Engine Load Sensing. This input can be achieved by either a throttle position sensor (TPS) or Manifold Pressure Sensor (MAP). TPS is usually the favoured method in normally aspirated applications, however in forced induction MAP is essential. All danST throttle body kits come complete with a throttle position sensor as standard. Additionally the throttle bodies all have connections for a map sensor (also useful for balancing) if required. 1.3 Air Temperature Sensor. An ECU needs to know the inlet air temperature to ensure fueling and ignition timing are correctly adjusted to the working conditions. If the engine already has an air temperature sensor then this can potentially be re-used, however temperature sensors cannot be 'piggy-backed' and thus if the original sensor is still driving another instrument/ECU a new dedicated sensor will need to be installed (usually in the air filter backplate, or simply close to the inlet in the engine bay). Please see our shop for suitable air temperature sensors. 1.4 Coolant Temperature Sensor. An ECU needs to know the engine coolant temperature to ensure fueling and ignition timing are correctly adjusted to the working conditions. If the engine already has a coolant temperature sensor then this can potentially be re-used, however temperature sensors cannot be 'piggy-backed' and thus if the original sensor is still driving another instrument/ECU a new dedicated sensor will need to be installed. Please see our shop for suitable coolant temperature sensors as well as a useful radiator top hose mounting kit. 1.5 Coilpack. The ECU's ignition drivers are used to power a coilpack (typically 'wasted spark'). Therefore the engine will require a coilpack and matching ignition leads - most 'modern' engines have a coilpack fitted as standard. Older, typically carburated engines will require one fitting. Please see our shop for suitable coilpacks. 2.1) OE Carburettor Engine. Carburated engines generally run on a low pressure fuel supply of around 3psi and therefore the fuel supply will not be sufficient from the standard (or aftermarket) fuel pump on an engine originally equipped with carburettors. Therefore a high pressure EFI fuel pump will be required along with the appropriate fuel pressure regulator. We offer high pressure EFI fuel pumps and adjustable fuel pressure regulators in our shop for this application. A schematic of the fuel supply plumbing can also be seen in the technical section of our website. It is worth noting that if you are already running an aftermarket electric pump for the carburettors this can be retained to feed a swirl pot (which in turn feeds the high pressure pump). Please see the diagram on our website for more details. 2.2) OE Fuel Injected Engine. The standard fuel pump on a vehicle running EFI as standard will usually be sufficient to fuel an individual throttle body set-up (engine spec dependent). Where an engines standard injectors and fuel rail are mounted in the inlet manifold (for example the Ford Zetec) it is necessary to utilise the bike injectors and rail. The removal of the original fuel rail and injectors will also likely delete the standard fuel pressure regulator and thus a replacement regulator will be required. We offer an adjustable fuel pressure regulator for this purpose (please see our shop). Where an engines injectors mounted in the cylinder head (eg Ford Duratec & 1800 MX5) customers have the option to retain this along with the standard regulator, further simplifying the install. If this route is to be taken please advise and we can blank the bike injector holes during production of the throttle body kit. 3) Throttle Linkage. The throttle cable connection is relatively simple on bike throttle bodies in comparison to other aftermarket offferings with no complicated linkages required. In most cases it is simply a case of adapting the end of the existing throttle cable (inner and outer) to interface with the carbs. Our throttle body kits come with the basic parts to achieve this adaptation, or the danST universal cable kit can be used to make a cable assembly up (see our shop for this kit). 4) Rolling Road Tune. Our throttle bodies are fully balanced prior to dispatch. However the ECU will need a mapping session using the necessary AFR equipment and under real world load conditions (usually on a rolling road). This will ensure the maximum performance is achieved and will avoid engine damage that can be associated with running excessively lean or rich. Are the danST Throttle Body Kits Compatible with my Fly-by-wire throttle? Any vehicle fitted with a fly-by-wire (electronic) throttle will need to be adapted to a traditional cable arrangement. What power increase will I see? Power gains are highly dependent on other work carried out to the engine. 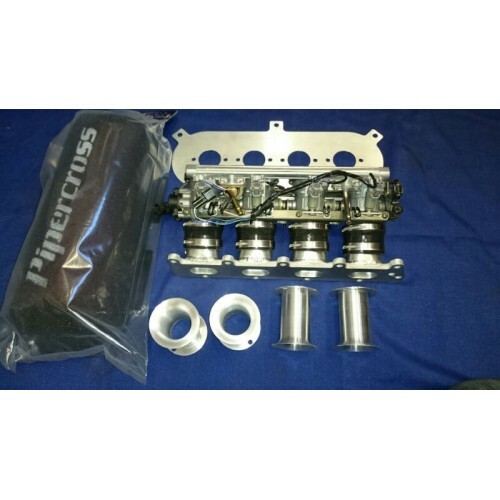 As with any induction modifications the throttle body kits will better compliment an engine that has had an exhaust manifold and system upgrade as a minimum. Camshafts and headwork will of course further benefit the power and torque curves. A typical healthy 2.0 Ford Zetec (standard 135bhp) will see 165-170bhp with an ITB kit and free flowing exhaust when correctly mapped. Please also see the various customer power graphs posted on our website for typical examples. How do I connect the fuel supply without a return on the fuel rail? How do I connect the Throttle Position Sensor? How do I wire the ECU?